A card game is played with a deck or pack of playing cards which are identical in size and shape. Each card has two sides, the face and the back. Normally the backs of the cards are indistinguishable. The faces of the cards may all be unique, or there can be duplicates. The composition of a deck is identified to each player. In some instances several decks are shuffled collectively to form a single pack or shoe. 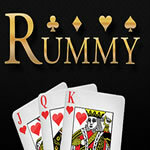 This section contains a number of online flash card games including solitaire!